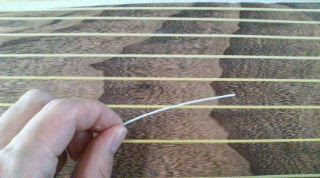 Strings is fixed screwes of right side. We use it for tuning in sometimes. I think that seventeen strings bass koto has various tone, dynamics and potential. 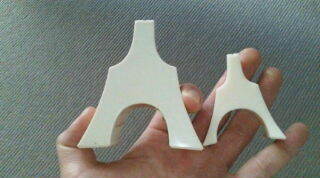 Koto has flexible briges on instrument body. 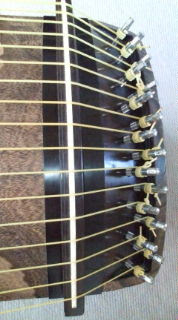 Big one is seventeen strings bass koto brige, It's bigger than Koto one. 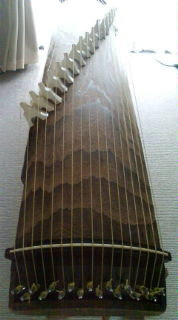 Seventeen strings bass koto has 17 strings, it's thick strings more than traditional Koto strings. This instrument range is alike Cello range. C-dur(c1〜E3) is particularly usual tuning. I commited new seventeen strings bass koto piece to same generation composer! Seventeen strings bass koto was planed by Michio Miyagi(1894〜1956) in 1921, So It was 90 years ago come 30th in this month. I'll inform this instrument to you! I use new design in a while.